This guide walks you through the setup and syncing of two iTunes Libraries over a network using SuperSync. Both computers use iTunes to manage that computer's music, movies, etc. If you are using a different configuration, please read this guide since the concepts in presented here will also help you understand the basics of SuperSync. Other configurations, such as syncing with a network drive are discussed later in this manual. Tip: Before attempting a complete synchronization, at least for the first time, you should synchronize only one or two files to make sure they're going where you expect them. Note: All of the Quick Start guides below assume that you are using iTunes as your default local music library. Typically your Local Library is configured to us iTunes and you then connect to various "remote" libraries such as iPods,iPhones, disk drives, and other networked SuperSync libraries. Install and launch SuperSync on Computer #1. 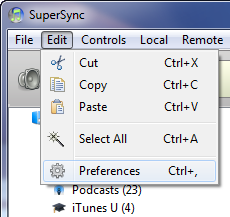 When the SuperSync starts, SuperSync will connect to your iTunes library and show it's content. Note: The first time you launch SuperSync, SuperSync will ask you if you want to enable the SuperSync Server and setup a password for server access. If you see this screen, you can enter it now, or later in the next steps. 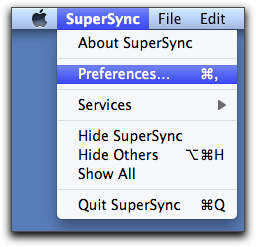 Open SuperSync's Preferences ( ,) via SuperSync's FILE menu (Mac) or EDIT menu (Windows). Next click Network Preferences tab. Enable/Check the 'Enable SuperSync Server' and the 'Accept Music Uploads From Other Networked SuperSync(s)' checkboxes. These checkboxes will allow your computer to be seen by other computers running SuperSync. Verify that the SuperSync Server is running by looking at SuperSync's Status Bar. In the lower right-hand corner of the SuperSync Window, the server status should change from "Publishing [yourServerName] to "Server Running [yourServerName]"
Note: If the SuperSync Server isn't running, confirm SuperSync's Preferences (Step 2). If you still have issues starting the SuperSync Server, see the Server Help and the Network Trouble Shooting Guide. Once you verify that the SuperSync Server is running, the configuration on this computer is complete. Leave SuperSync running since we will be connecting to it later in this quick start. Repeat Steps 1-5 on Computer #2 (and any other computers if you have more than a 2 client SuperSync license). From Computer # 1, in SuperSync's Remote menu, select the 'Connect to LAN Server' command and then select your Computer # 2. After selecting your Computer #2, SuperSync on Computer #1 will connect to Computer #2's library. Note: You can initiate the connection from either computer since the SuperSync Server is running on both computers. Tech Info: The Connect to LAN Server looks for other SuperSync computers via Bonjour. If you don't see your other computer, you can manually enter your other computer's IP address by using the 'Connect to Server' command in the Remote menu. Once SuperSync connects to the other library, SuperSync will connect to that computer and display both libraries (the Local and Remote libraries) in the SuperSync Window. At this point, both libraries are connected. We will now use SuperSync to compare and sync content between the two libraries. Once SuperSync is connected to another library, you will see 'Library Sources' in SuperSync's 'Filter Tree' pane. This shows the tracks that are in your remote library, where blue tracks are Remote Only, and Turquise tracks are in both the local library and remote library. By clicking on one of the Library sources, you can see tracks that are synchronized (in both libraries), unsynchronized (in just the local or remote library) or any combination. Select the 'Local Unsynchronized' view to see songs that are on your computer (aka the Local Library) but not in the Remote Library. Select the 'Default View' view to see all the tracks in your library. 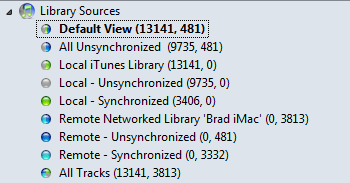 Other views can show unsynchronized tracks, synchronized tracks, All local or remote tracks, etc. Filters are covered in detail in the Main Window section. Synchronized track. Track is in both Local and Remote libraries. Synchronized track. Track is in both Local and Remote libraries. Turquoise tracks are usually omitted so that you don't see two of every synchronized track. 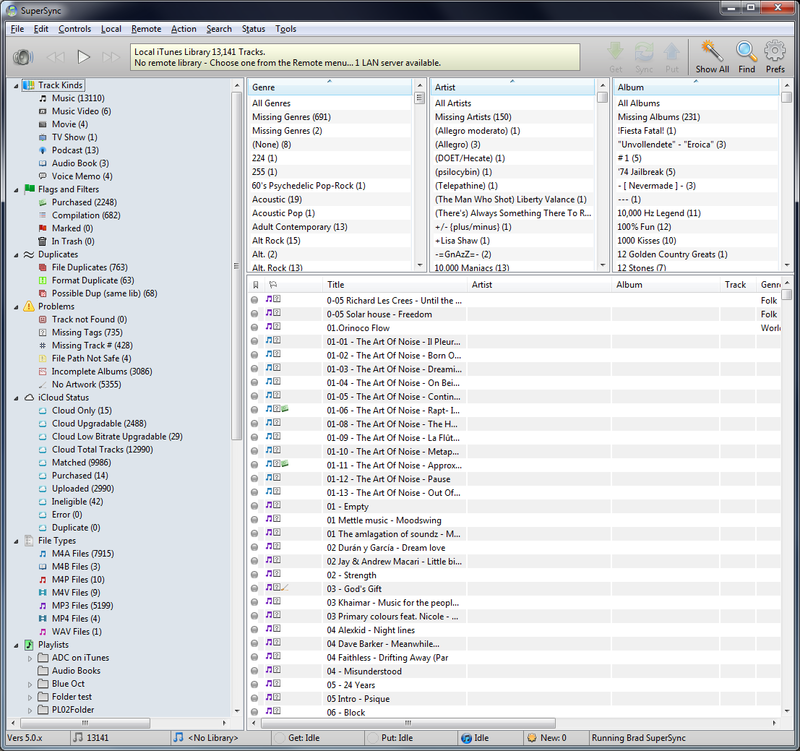 You have now selected the key views for determining which songs need to be synced. In the next section, we will be selecting tracks and syncing them between the two libraries. In SuperSync's Track List, find a unsynchronized track (either a Local track [ gray dot] or Remote track [ blue dot]). Once you use the Get, Put, or Sync actions, SuperSync will open the Transfer Status Window and show you the status of your transfer(s). 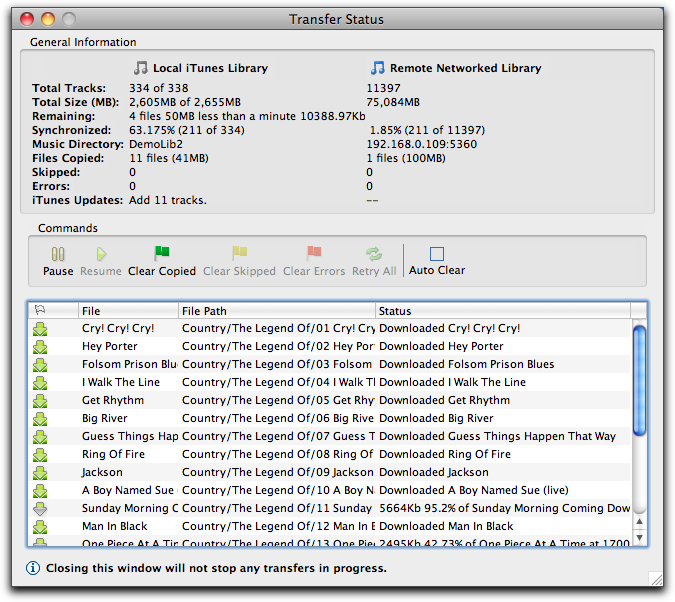 Note: The Transfer Status Window shows detailed information about your transferred files such as number of songs transferred, total size (in MB) of transfers, number of files skipped (due to duplication or errors), iTunes Updates (SuperSync telling iTunes to make updates to its database), etc. Once your tracks have been transferred, SuperSync will update its Track List and, if necessary, tell iTunes (on either your computer or the Remote computer) to update its database for the newly added songs. You can confirm that your files were transferred successfully by opening iTunes on either computer. Please note that transferred files may not appear immediately since iTunes may take a few moments to complete its database updates. You can also use the ''Local Synchronized' and 'Remote Synchronized' views in SuperSync to see if your synced songs appear as 'synced' (with either a green dot or turquoise dot). If you wish to sync more individual tracks, repeat Steps 1 through 4. If you want to synchronize all the songs between both libraries, you can select an entire view and then select the Get, Put, or Sync actions. You have now learned how to transfer songs between two libraries using SuperSync. 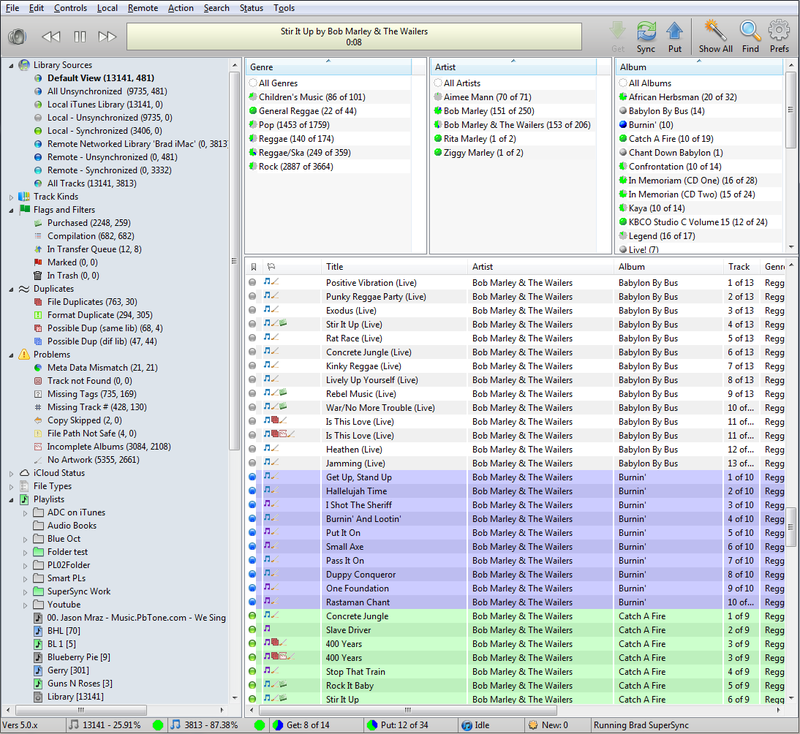 At this point, you have connected two iTunes libraries on two different computers and synced tracks using SuperSync. This is the way SuperSync is most commonly used but there are many other ways of using SuperSync. You can use SuperSync to listen to your music, share/stream your music via web browser, copy songs from an iPod, iPhone, iPad, etc, sync and backup your data to an external drive, etc. The rest of this section quickly describes how you can sync your Local Library with other types of Remote libraries. It also describes different ways to access your libraries (e.g. via a web browser or via SuperSync across the Internet/WAN). Under the Remote Menu, select "Connect to iPod or iPhone..."
Connect an iPod by USB. When found, your tracks should be loaded. Select any Blue playlists from the Playlist Tree to synchronize the playlists. Close the Remote library when done from the Remote menu to disconnect the Apple mobile device. Click Set... to set the hard drive or directory you'd like to import and click Next. 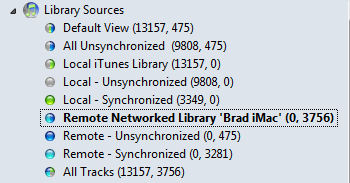 Select one or more Blue tracks you'd like to import and click "Synchronize"
When finished, close the Remote library. Click Set... to set the hard drive or directory you'd like to export tracks to and click Next. Select the Gray tracks you'd like to export and click "Synchronize"
Tracks that have been copied to the remote drive, the tracks will turn Green. To access this SuperSync server from outside of your WAN, check the UPnP checkbox. Be sure to set your passwords. 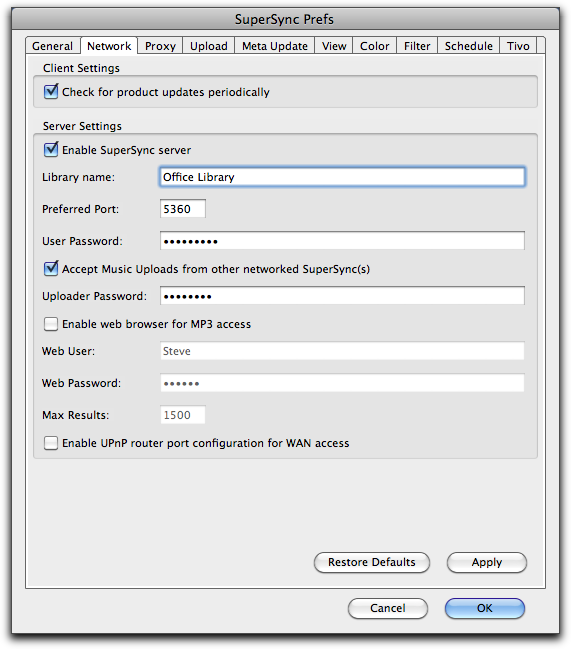 Opening the firewall for SuperSync traffic on your O/S and/or router may be needed. Determine the IP address and port of this computer by using "Check my IP..." under the Tools menu and test the connection! On another SuperSync computer, use the Connect to Server... from the Remote menu and enter the WAN IP address, followed by a colon and the port number. SuperSync's rescan feature will find missing tracks (shown in iTunes with a !) or add tracks that are on disk but not in iTunes. From the File menu, select "Rescan Local Library..."
Remove duplicates is covered in its own help chapter. Read it carefully before attempting to delete duplicate tracks. Setting up SuperSync for iTunes Match help SuperSync work with tracks that are on iCloud. Enable the SuperSync server and check the Web Access button in the network settings. You should see a web page with your music available for browsing via the web. To access your music over the WAN, you'll need to enable port forwarding on port 5360 or enable the UPNP check. We have now covered the most common way of setting up and using SuperSync. Our next section, The SuperSync Window, describes the SuperSync Window's features and use.